Google CEO Sundar Pichai Receives $199 Million Stock Grant From Alphabet Inc : Making him the highest-paid executive of a public traded company in the US, Google Chief Executive Officer Sundar Pichai has been awarded a stock grant valued at $199 million or nearly Rs 1,356 crore by parent company Alphabet Inc. The value of his stake could change dramatically with the recent volatility in tech stocks. The award is the biggest ever given to a Google executive officer. 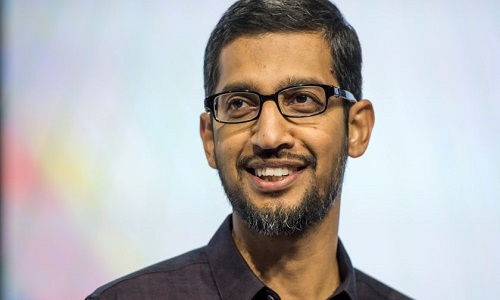 It is also Pichai’s first award since he took over as CEO in August 2015. In a securities filing Friday, Alphabet said it awarded Mr. Pichai 273,328 Class C Google stock units on Feb. 3. At that time, the grant was valued at $199 million, though subsequent declines in Alphabet shares put the current value at about $182 million. On the same day, Pichai sold 375 Class A common shares at a price of $786.28 each, and 3,625 Class C capital stock at a price of $768.84 each, the filing said. Alphabet also awarded $42.8 million in restricted stock to Diane Greene who now runs Google’s cloud business. Chief Financial Officer Ruth Porat received equity worth $38.3 million. According to a report in US-based Mail online, Alphabet overtook Apple to become the world’s most valuable public company on February 1 after it reported better-than-expected quarterly revenue.